I am a huge Oliver Jeffers fan, so when a trusted employee at my indie book store brought me a new book by him and told me that everybody at the store loved it, I said, “I’m not even going to read it first, I’m buying it!” And I did. And predictably, I have no regrets. 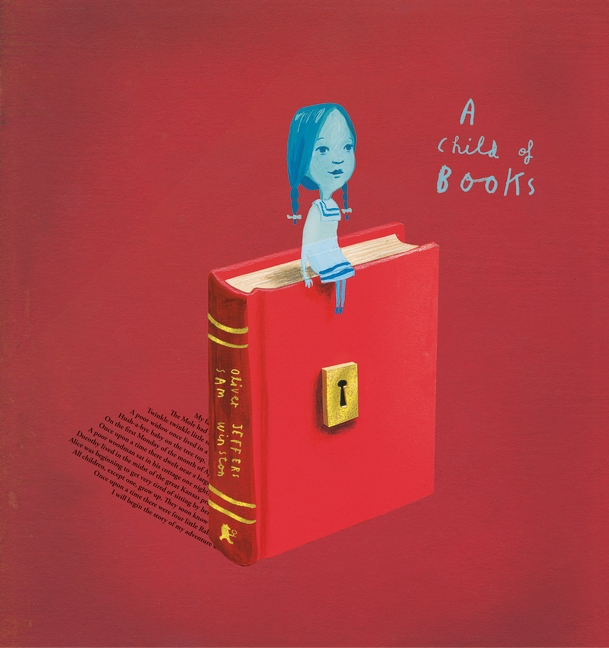 A CHILD OF BOOKS, by Oliver Jeffers and Sam Winston, is a beautiful book, a lovely book. It was written and illustrated by both men. You can definitely recognize Jeffers unique and charming illustration style and his unique lettering. 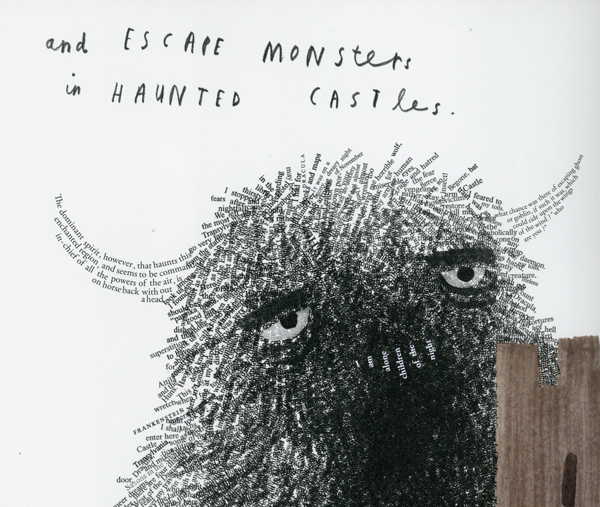 What is fascinating to me is the use of text from children’s literature as an illustration tool for constructing backgrounds and shading and elements of the drawings. Even the end pages are engaging. 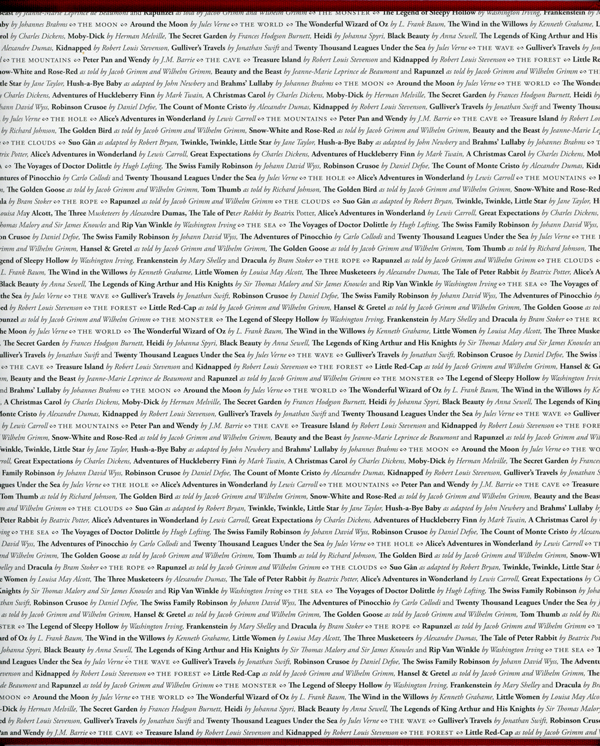 The story is almost more a declarative ‘wonder or power of reading,’ tale rather than a story with a traditional arc. 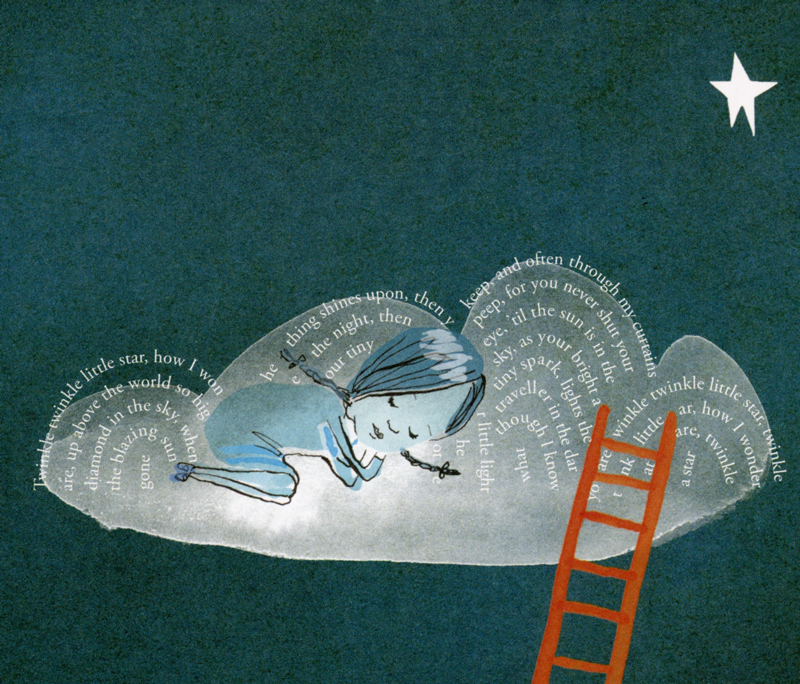 The main character, a young girl, explains to us why she is a child of books, how she “…came from a world of stories and upon my imagination I float.” Her narrative is engaging and comfortable. 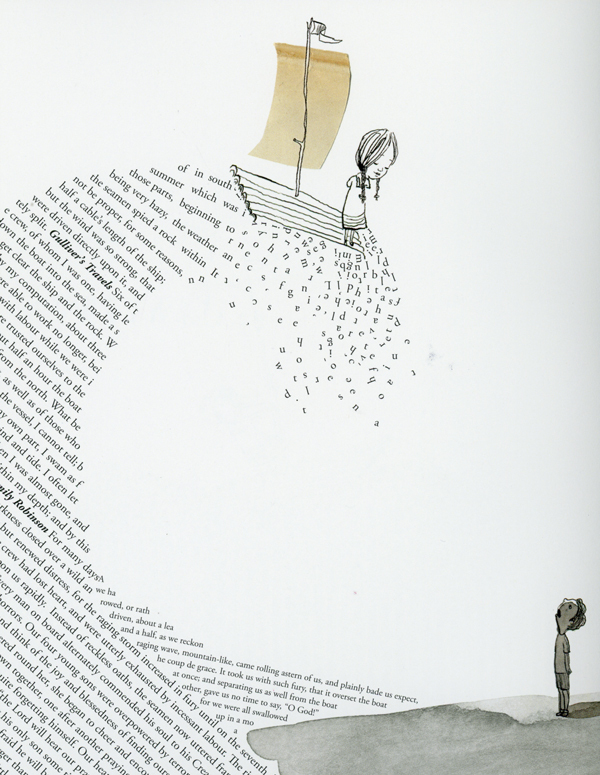 She sails across a sea of words to ask a sad, young boy to join her in this world of words. She shows him different places stories can take him, from castles with monsters, forests of fairy tales, and even outer space. They create their own world with their stories and invite all of us in. I’m touched by this story, even though we’ve heard the same positive message in numerous different ways. This is a truly unique telling. Every time I read this book I marvel at the simplicity of the story and how personal it feels. Warming. Then I break out my magnifying glass and peruse all the text used in the illustrations. Some I recognize, some I can take a stab at, and some of it is evocative without any idea why or where it is from. Again, this is a beautiful book. I don’t know how many repeat readings it would have garnered with my boys when they were young, but I would have read it, over and over. Read it once, then read it again, magnifying glass in hand. I love a book that stretches my imagination. And this one does! Thanks for sharing. This book is so cleverly done and well worth a look! 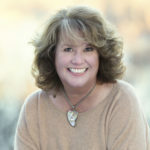 I love the images that you’ve shared here, Kevan. It has been on my library request list for quite some time. I’m looking forward to reading it even more now–thank you! It looks amazing! I’ll buy it without reading it too! This looks amazing. I can’t wait to check it out. I just checked this out at our local library. I was mesmerized! So creative. OHHH, can’t wait to read this one! Looks fantastic! I have been baiting my breath for this one! 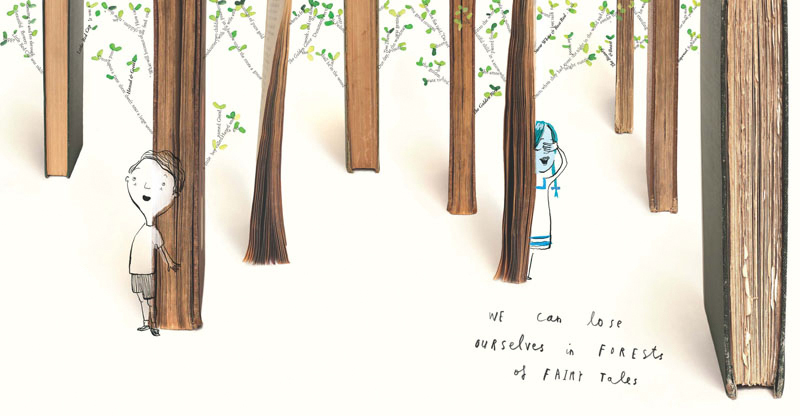 Look at that illustration with the books as tree trunks! Brilliant!!!!!! Thanks for this great post, Kevan! Thank you for your heartfelt review! I need to own this one too!